Recently in answer to Councillor McDonald's questions in relation to a potential Gold Coast cruise ship terminal being only a 'transit terminal', ASF China's Allan Fife abruptly declared 'IT'S NOT A TRANSIT TERMINAL'. A transit port requires minimal infrastructure compared with a 'non-transit' port, as a transit terminal is a matter of getting the passengers off the ship and on to transport after customs processing. But transit terminals bring very little economic benefit to the host port. Anyone who has visited the Port of Brisbane is aware of the sheer size and infrastructure required for a 'non transit' port; that is, a home or base port where passengers begin and end their voyagers. 'Non-Transit Port Infrastructure includes fuel storage, fuel bunkers or barges, warehousing for supplies, customs/immigration/quarantine buildings, tug boats, luggage loading areas and equipment, fresh water supply, sewage and hard rubbish disposal, fork lift and truck tarmacs; that is, possibly 100's of hectares of infrastructure. Did anyone see this infrastructure illustrated in ASF artist's impressions in their recent full-page print ads? Misleading people about the size and scope of a development is neither legal nor ethical. The Port of Brisbane is right next to the International Airport and 45 minutes away from Griffith University and the start of our soon-to-be operating Light Rail. Brisbane cruise passengers can easily access the Gold Coast but it requires appropriate marketing as Mt Tamborine businesses have been doing for years. These days with traffic gridlock through-out the Gold Coast it takes longer to get from Surfers Paradise to the Gold Coast Airport than it does from Brisbane port to our Light Rail system. And Brisbane is a deep-water natural port not a shallow estuary like the Broadwater. Thankfully 6 Councillors have outright rejected the ASF China proposals for obvious reasons whilst a few others are 'waiting for details'. 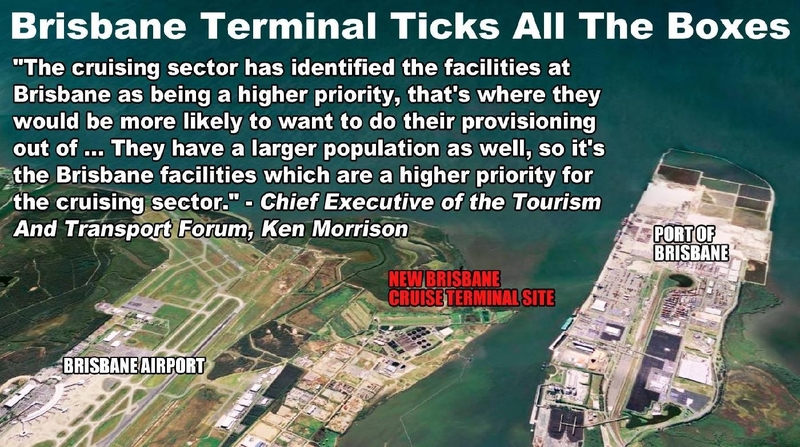 To date no detail is forth coming - just vague artist impressions and grossly overstated promises of '36,000 fulltime ongoing jobs' resulting from the construction of GC cruise terminal, if you believe Tom Tate. 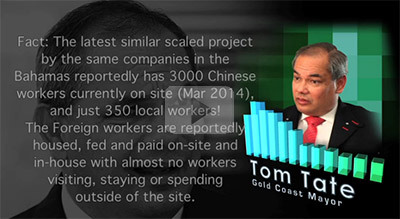 This figure is a lie Tom, with the obvious intention of misleading Gold Coasters! The reality is more like a few hundred jobs during construction. And as ASF China admits there will be a building construction zone for 'up to two decades' in Biggera, Labrador, Southport, Main Beach and on the Spit and Wavebreak Island. This will come with the subsequent loss of the well-documented economic and environmental values and the 2500 FTE jobs supported by the Broadwater as it currently exists. With the planned expansion of cruise ship terminal facilities in Brisbane why is anyone even considering a Gold Coast CST? The Broadwater Marine Project (BMP) was stopped because ASF 'could not tick all the boxes' (financial, economic, environmental, social, probity, sovereign entity issues etc) according to Deputy Premier Jeff Seeney. In fact ASF did not attempt to address any of the requests by the State Government. So no 'preferred proponent' was chosen by the State for the BMP. ASF China did not complete the required homework. Why? No funds, no investors to pay for it? But of note, ASF had double dipped by also applying for the State request for Expressions of Interest for an 'Integrated Resort Development' which comes attached with a casino licence but does not necessarily require a cruise ship terminal. It's time to finally put this farce to rest - permanently. ASF China's Allan Fife has also recognised issues with navigating today's large Cruise Ships into the Seaway according to a report in the Gold Coast Sun by Jack Haughton 7-May-2014. SOSA has pointed out for over a decade that the Gold Coast's sand movements and weather, tide, current, swell, wave and wind conditions prevent any size cruise ships from safely navigating into the Seaway and Broadwater except on the rarest of days and in the calmest of conditions. A terminal at Wavebreak Island brings even greater engineering obstacles and environmental difficulties than the terminal proposed on Doug Jennings Park, especially as Wavebreak Island, as its name suggests, was engineered as a sand island (built on an existing sand bank) to absorb wave and swell energy during flood, storm and cyclone events in order to protect life and property on the western Broadwater. Any hard infrastructure on Wavebreak will negate the engineering purpose of the island. Hence with precious little detail and a reliance on existing flawed navigational studies and after numerous council votes, ASF finally admit they cannot expect ships over 310 metres to safely navigate the heavily dredged channels and which requires the destruction of the high-value marine habitat which currently exists in the Seaway and Broadwater. A redundant plan and a flawed process with the best option a short drive away. Port of Brisbane. 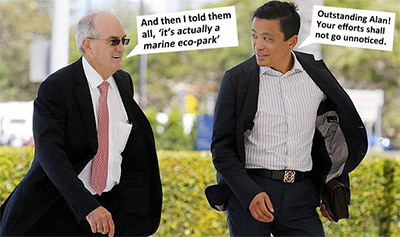 Some Gold Coast Councillors (the Tate-8 who always vote in a bloc with the Mayor) need a reality check - this is not the Love Boat - they have been voting on an obsolete plan for an environmental and economic disaster - well and truly documented by the previous Labor Government. However ASF's current proposal includes the private commercialisation of Wavebreak Island, Marine Stadium and consequently several kilometres of public beach and foreshore - for what? Should we just hand ASF China a casino licence and our entire Broadwater and get Tom to cut the ribbon? Could they leave a couple of fish for old time's sake? Oh that's right we get an aquarium, an 'eco-marine park' as a replacement. Folks, it is time to hold some special 'events' to remind these land thieves that Gold Coasters have no intention of handing over our jewel to a bunch of 'entrepreneurs' who change their story every week e.g. 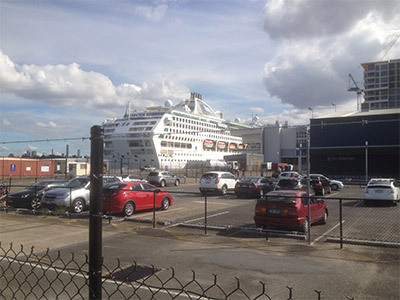 'Spit cruise ship terminal', 'Wavebreak terminal', 'off-shore terminal' (Tate), 'no terminal...just give us Wavebreak and a casino licence for goodness sake'. People's lives will be directly affected, and all we get no detail but lots of PR spin on unsubstantiated and unverifiable jobs and 'economic benefit' figures. Even our Councillors who represent the community are fobbed off when asking for detail from ASF China. Is it information access only for a select few in Mayor Tate's inner-circle and not our elected Councillors or the public? And what further threats have been made lately to Councillors who have made honourable decisions and voted on behalf of their community? Are the current threats to Councillors' divisional funds, toilet breaks, media announcements and Twitter usage retaliation from a vindictive Mayor? SOSA, along with other groups, have lodged detailed complaints and evidence with misconduct and corruption bodies like the CMC, Local Government Ombudsmen, Qld. Minister for Local Government, ASX, ASIC and ACCC regarding the lack of probity and due process and the advertising of false and misleading information in relation to GCCC and ASF China's behaviour. We will continue to scrutinise, criticise and analyse every aspect of GCCC decision-making and reports and ASF China's proposals, corporate structure and behaviour. We are thankful for the ongoing assistance and research conducted by numerous community members, many of whom are experts in their fields of engineering, environment, economics, tourism, biology etc. The Spit and Broadwater are a unique expanse of natural habitat, a tourism drawcard with world class surfing, diving, fishing and boating and a much loved recreational area for the majority of Gold Coasters and regional, interstate and international visitors and tourists. We have just achieved record tourism figures, based on the support of domestic Australian tourists and families. The cries for a 'big ticket construction item' (white elephant) are a fraud and not backed up by verifiable tourism statistics. The current balance between public open space, foreshores, parks, waterways, islands and existing tourism infrastructure is working. Whether it's in a tinny or a luxury boat, with a snorkel or scuba equipment, a handline or game fishing tackle, a short board or a body board, flying a kite or walking the dog - this development threatens the very lifestyle of many Gold Coasters. We have no intention of allowing a few ill-informed, self-interested politicians to give our public parks, foreshores, islands and beaches away to private commercial interests for their exclusive use and they are about to hear it loud and clear. Please donate to help us plan and execute some major events to clearly demonstrate the massive opposition to this thinly disguised takeover of our Spit and Broadwater.